Yesterday we ventured out into the storm-torn Kentish countryside. Public transport was at a standstill after hundreds of trees fell onto train lines linking the county to the outside world. Fortunately the roads were clear enough for us to get through; just a few large puddles to navigate here and there. In the Elham valley, many villages along the ephemeral Nailbourne were either flooded or recovering from flooding. In our many visits to the area we have never seen the faintest trickle of water in the chalk bourn, which flows only when there’s excessive rainfall. 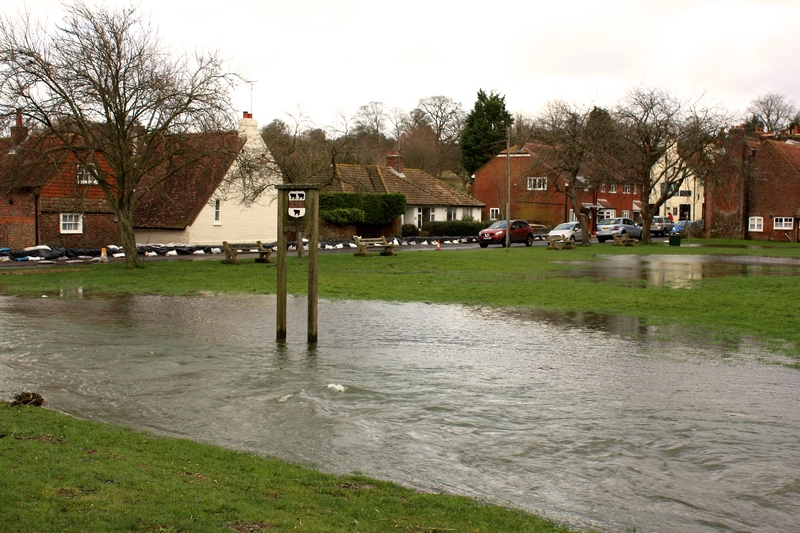 As you can see from the photograph below, taken in Barham, the Nailbourne’s course is now full to bursting. More than a handful of the village’s cottages were being pumped out after water rose up through the floorboards, which must have been a horrible experience. I am sure it must be little consolation to those homeowners, but calmer weather is finally on the horizon. Today dawned chill, dry and bright; perfect weather for a good sweep-up and sowing my sweet peas. I am nursing a nasty temperature, so will be sure to wrap up warm. Cheering me through my man flu are flurries of snowdrops, which suddenly seem to be everywhere I look. We only have a handful in our coastal garden, which appear annually from beneath the fronds of Polystichum setiferum ‘Herrenhausen’. In our local park, common-or-garden Galanthus nivalis has naturalised beautifully, popping up through mounds of ivy and decaying horse chestnut leaves. Down in Barham, dodging the flood water, we discovered swathes of double snowdrops, Galanthus nivalis f. pleniflorus ‘Flore Pleno’ (top) edging the carpark at the local pub. They seemed to relish the deep gravel, which presumably offers the good drainage snowdrops like. On higher ground near the church there were ribbons of nodding flowers sheltering in the lee of a wall. The clump pictured below appeared to be a mixture of large and small-flowered varieties, making a lovely bouquet. Let’s hope we have finally seen the last of this hateful weather and can now look forward to a somewhat drier, brighter spring. 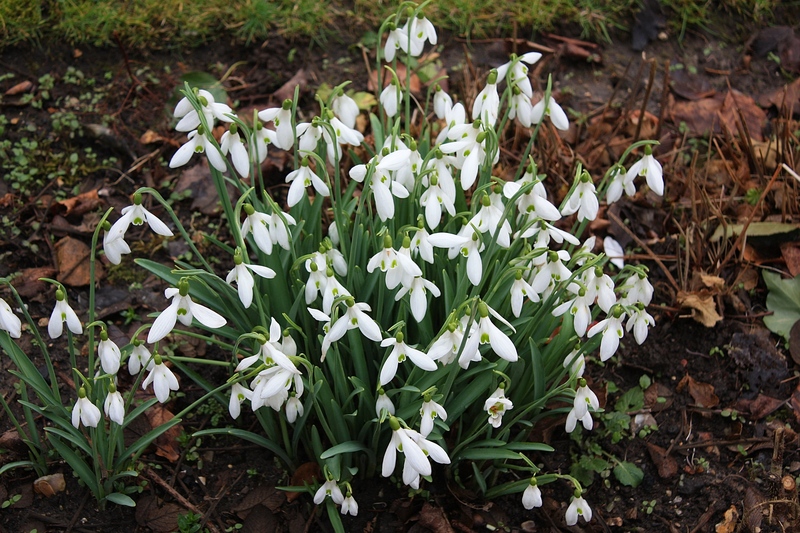 We are both awash with white, you in lovely snowdrops, me in feet of snow! Both beautiful. It will be quite a while before I get to see the fruits of my labor from last spring when I planted loads of Galanthus bulbs all over my from lawn where the snow goes away first. I feel for everyone hit hard by the storms……we experienced the same thing but without the wind when Hurricane Irenen hit us a couple years ago….not fun at all! Its been a horrible winter weather this year everywhere you look; your snowdrops pictures makes everything a little brighter though! Yes, heres to a brighter dryer spring, your snow drop photographs are very cheery. Get well soon! Thank you. I’m a terrible patient and can’t sit still, so I don’t help myself! 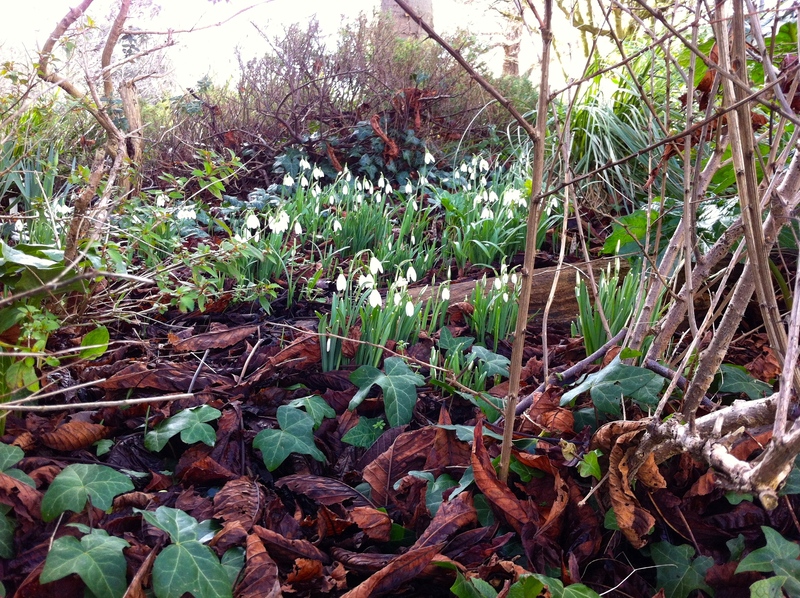 Oh, those beautiful white snowdrops, bringing some joy in the midst of all that rain. We see pictures of the extreme floods on our TV news and I hope your are high and dry. There is so much crazy weather world-wide. Here in Queensland, Australia we are sweltering and struggling to cope with a serious drought. Better days lie ahead!